Stock photo of the beautiful Our Lady of the Immaculate Church in the town of Guelph, Ontario, Canada. Our Lady of the Immaculate church is a wonderful display of architecture in the town of Guelph. 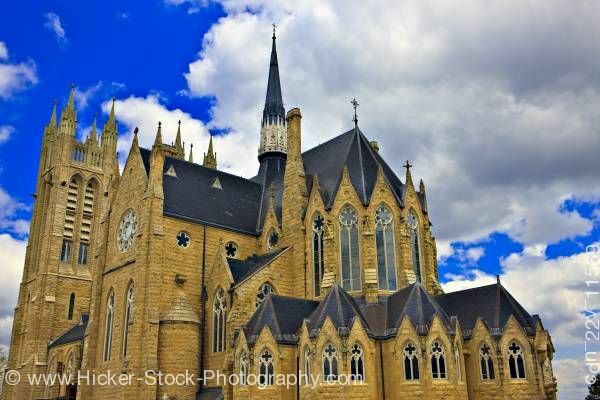 This stock photo shows the beautiful Our Lady of the Immaculate Church in the town of Guelph, Ontario, Canada. The church is a grand display of Gothic style architecture. Arch stained glass windows with a cross, clover, or flower shaped cutout in the white trim. In the front is four sections of half circle structures each with three arched windows and above the windows the stone peak to the roof. Above there is a larger curved section with long arched windows and the stones peak at the roof. The peak of the roof at this section has a cross. On the left of the larger section is an extension to the church with a flat front, two long arched windows and a round medallion styled window. A square tower with arched windows and ornate spires is part of the back left of the church. Another small tower with a long pointed spire with a cross at the top of its peak sits highest on the roof. Our Lady of the Immaculate Church in the town of Guelph, Ontario, Canada.